Fathom Events Presents "Sailor Moon SuperS: The Movie"
This past weekend VIZ Media partnered with Fathom Events to present a limited screening of Sailor Moon SuperS: The Movie at over 590 movie theaters across the United States. Sailor Moon and the Sailor Guardians unite on the big screen to continue the fight for Love and Justice. Anime screenings like these are absolutely great because most of us never had the opportunity to catch these films on the big screen. Others are being introduced to them for the very first time alongside other fans. Everyone unites to watch the movie and even test their knowledge with some trivia while waiting. We are very excited to partner with Fathom to bring the next set of Sailor Moon movies to audiences nationwide. Catch the adventures of the Sailor Guardians the way they were meant to be seen – on the big screen – at this summer’s exclusive Sailor Moon theatrical events! Prior to Sailor Moon SuperS: The Movie, moviegoers were treated to a never-before-seen presentation of Ami’s First Love short. As the title suggests, this short features Ami Mizuno as she tackles the notion of falling in love with an unknown intellectual rival. 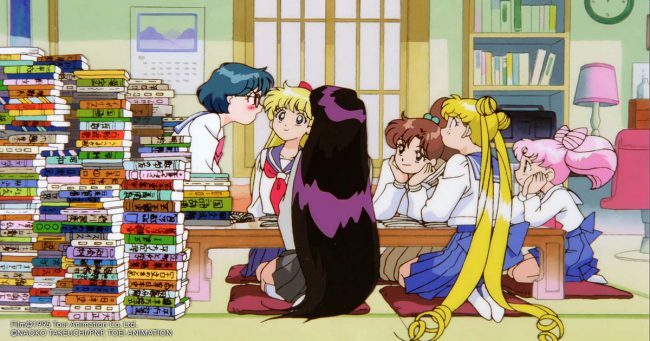 Ami is the bookworm of the bunch and is perplexed by the idea of being in love so much so that love letters break her out in hives. She’s literally allergic to the idea of love which perplexes the other sailor scouts. As Ami becomes consumed with trying to outsmart her rival, an evil spirit appears to use her overwhelming passion against her. Ami’s First Love is an adorable and hilarious exploration into Ami’s reasoning towards love which is something that she can’t easily quantify with a grade like her studies. Afterward, it was time for the main attraction: Sailor Moon SuperS: The Movie. Children are being hypnotized by fairies and kidnapped across the world. 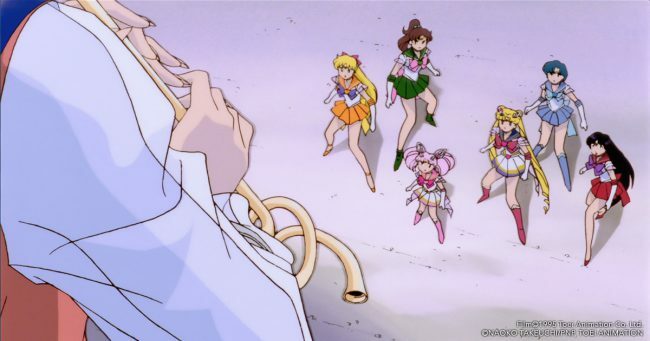 It’s up to the nine sailor scouts to figure out where the children are being taken to and why. Sailor Moon SuperS: The Movie explores Chibiusa and Usagi Tsukino’s relationship and battle for Mamoru Chiba’s affection. When Chibiusa is abducted, the scouts team up with a mysterious stranger that has fallen for her in order to defeat a strong villain. This villian intends to encircle the world in complete darkness while leaving everyone in a state of eternal sleep. 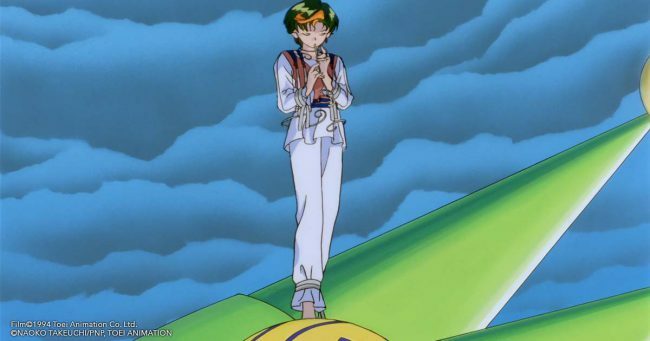 As they try their best to save Chibiusa and the other children, the scouts will have to work together to see past the villain’s deceptions to prove that love can conquer all. What’s great about anime screenings like these is reliving old memories and sharing them with others. It’s been a while since I’ve seen the movie but I loved cheering alongside everyone during certain scenes. Bobbing my head to the theme song in Japanese and even seeing a couple of cosplayers posing for photos. It’s truly a fun experience no matter what the film. So, if you missed out on this one, I highly suggest bookmarking the Fathom Events Collections page to check out the upcoming screenings. Current notable screenings include several Dragonball Z features and Digimon Adventure tri. : Future. Looking for more Sailor Moon? Check out Viz Media for news, episodes, DVD details and merchandise! Established in 1986, VIZ Media is the premier company in the fields of publishing, animation distribution, and global entertainment licensing. Along with its popular digital magazine WEEKLY SHONEN JUMP and blockbuster properties like NARUTO, DRAGON BALL, SAILOR MOON, and POKÉMON, VIZ Media offers an extensive library of titles and original content in a wide variety of book and video formats, as well as through officially licensed merchandise. Owned by three of Japan’s largest publishing and entertainment companies, Shogakukan Inc., Shueisha Inc and Shogakukan-Shueisha Productions, Co., Ltd., VIZ Media is dedicated to bringing the best titles for English-speaking audiences worldwide. † Photos provided by VIZ Media. ‡ There are no affiliate links included in this post. ºVIZ Media provided tickets for review purposes only.